I am a firm believer that texture is an important aspect to good food. With that in mind, your chopping skills are super important. With this dish, the smaller the better. 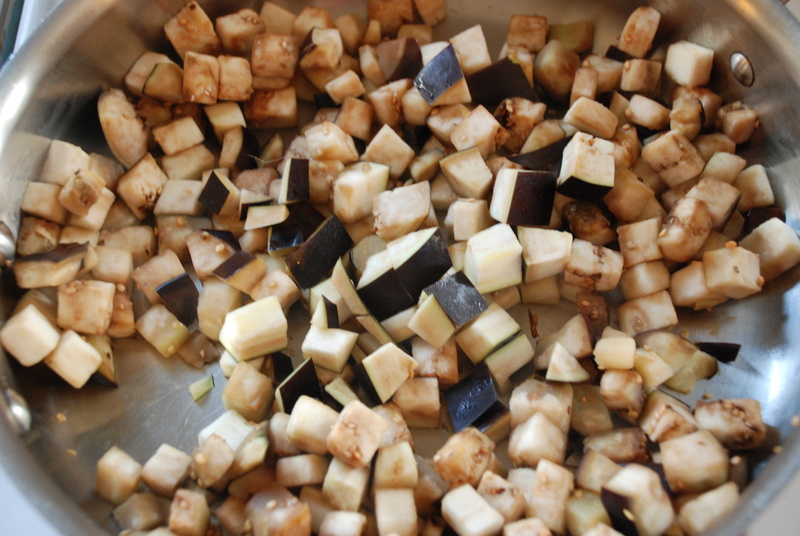 I decided to chop up my two eggplants into 1/2 inch cubes before I threw them into a hot skillet with coconut oil. You can even go for a 1/4 inch chop. 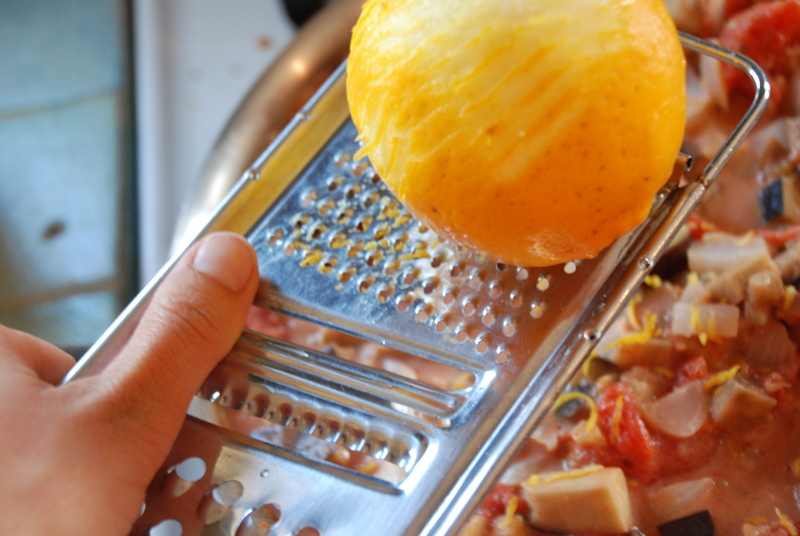 Here, I left the onion chopped rather rough. Feel free to go smaller, but I figured that the onion would cook away to a silky texture, so it didn’t need to go super small. Time to get to mincing! I minced up four cloves of garlic and a good two-inch nugget of ginger. 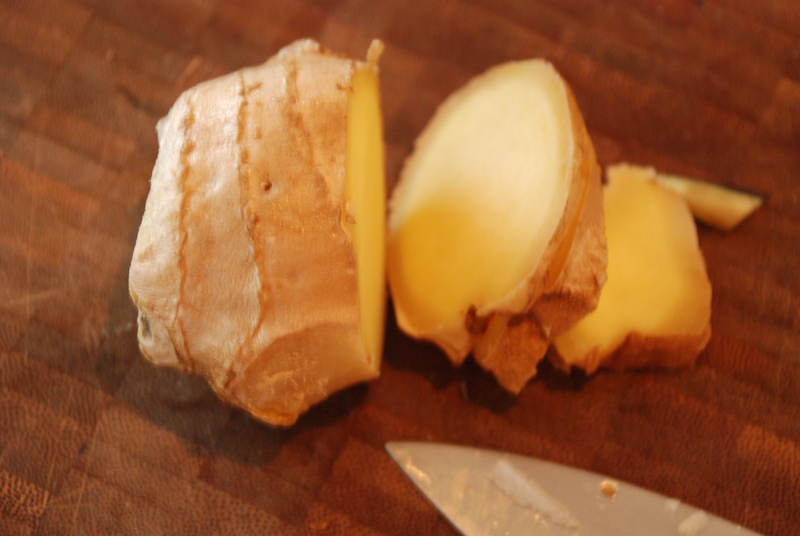 Oh, and if you have ever gone to the trouble of peeling ginger before mincing, don’t bother. Yes, you can use a spoon to scrape the skin away easily, but why take the time. When you are mincing and simmering, the skin makes no difference. Yay for time-savers! 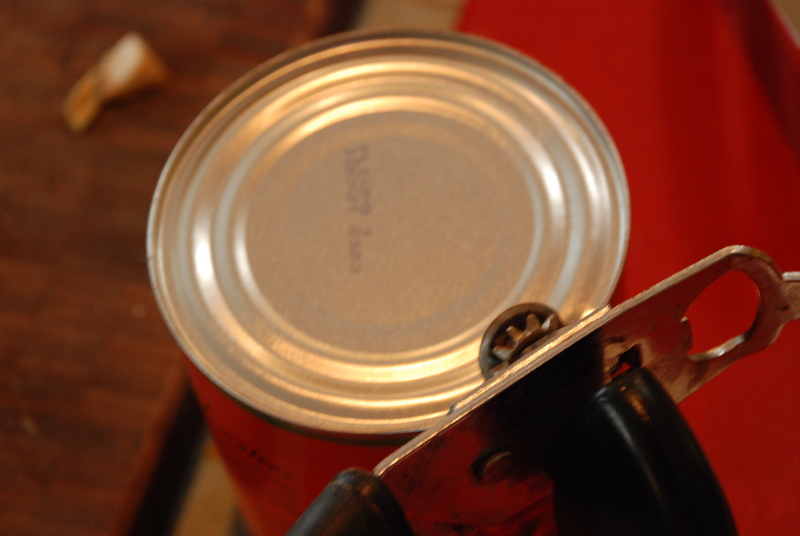 I believe I told you about my mad skills at opening cans and dumping…here I am in ACTION! 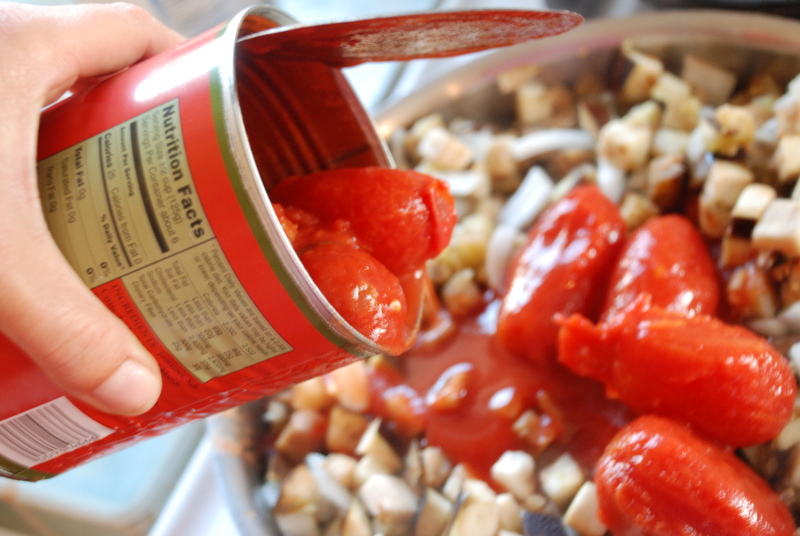 I love to use the canned whole tomatoes for dishes that I simmer away…maybe it is the comfort of recognizing the food for what it is (an obvious Roma tomato) or maybe it’s just that I love jabbing and stabbing with my wood spoon, on the way to creating the perfect texture. Who cares, it’s fun….and yummy! Enough shenanigans…it’s time for some ZEST! Remember, one of the most important elements of any Asian dish, is the Ying and Yang…you have to balance the sour with the sweet. So, follow the juice of one lemon with a 1/4 teaspoon of sugar. Then, add in some cumin, cinnamon and cayenne. Now, time for some fresh herbs to make the Thai vibe complete. 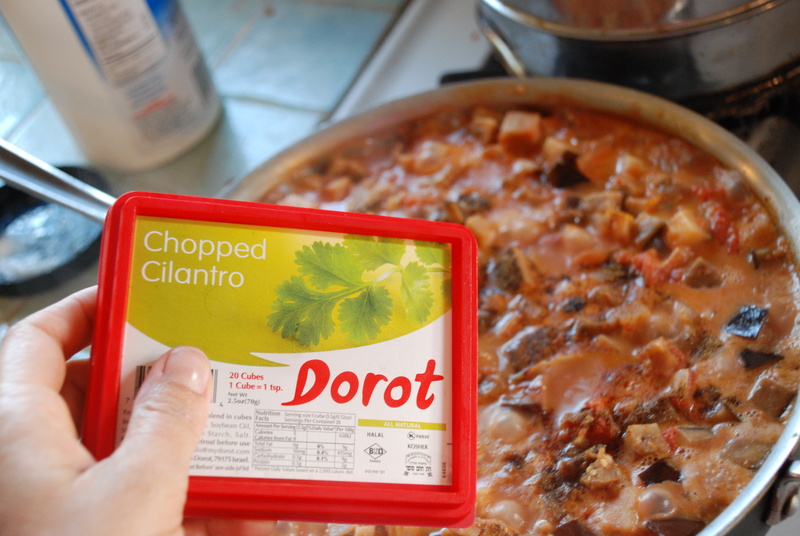 Of course, you can always add in a fresh bunch of cilantro and basil…but I was out. Enter one of my favorite things to keep in my freezer, frozen fresh herbs (oxymoron for sure). 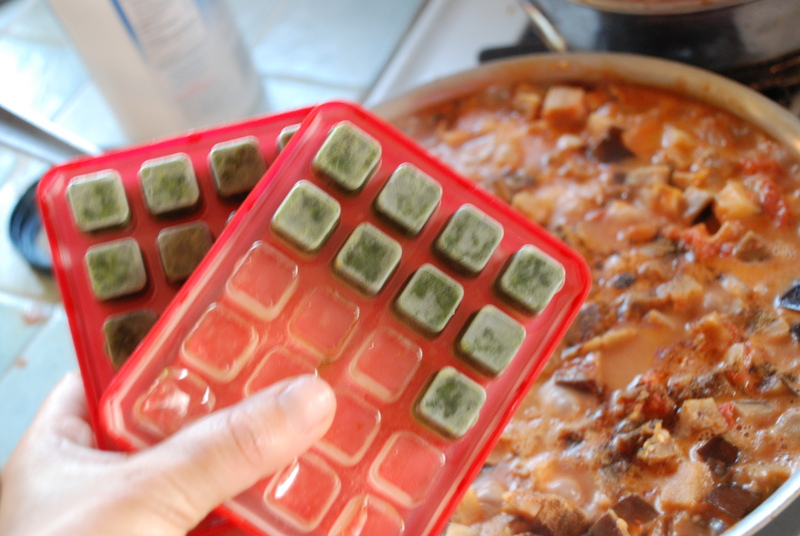 They are in tidy little one teaspoon squares, already minced….oh, and they never get slimy. 🙂 Just pop them out and mix ’em in. The fresh herbs were the last flavor step…now it’s time to heap up some hot rice and ladle up some creamy, delicious Thai Eggplant. 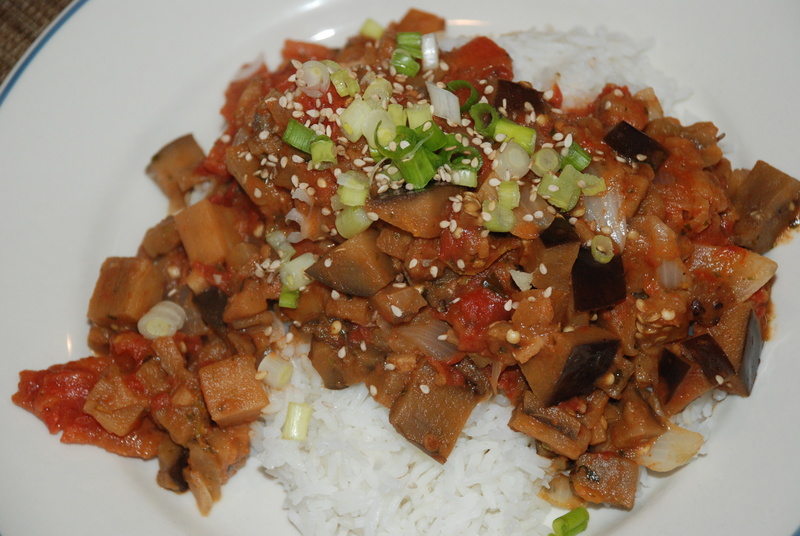 I topped it with some fresh green onions and sesame seeds…great for color and taste. The best part about this dish is how the creamy sauce drips down into the rice and coats it with luscious flavor. 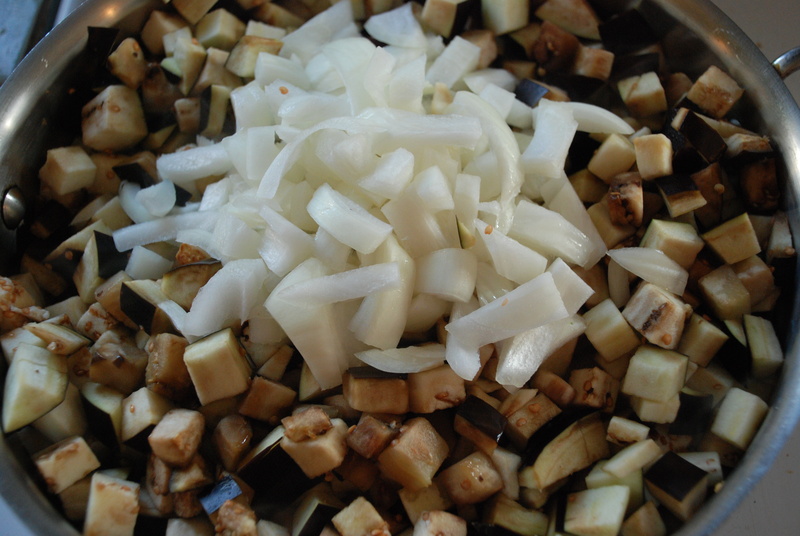 Saute the eggplant, onion, garlic and ginger in the coconut oil. 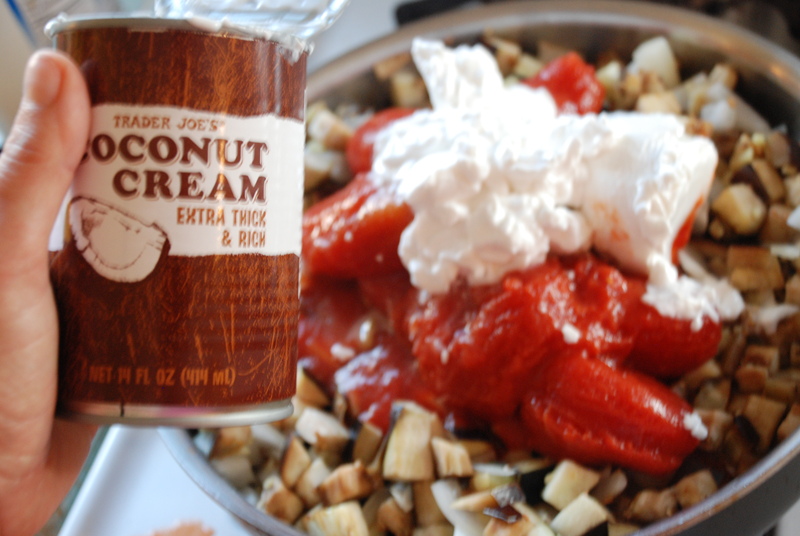 After they have softened, add the tomatoes, coconut cream, spices and salt to taste. Let it simmer away until the eggplant has softened further, approximately 15 minutes. Just before you are ready to dish up, add the fresh/frozen herbs and mix well. 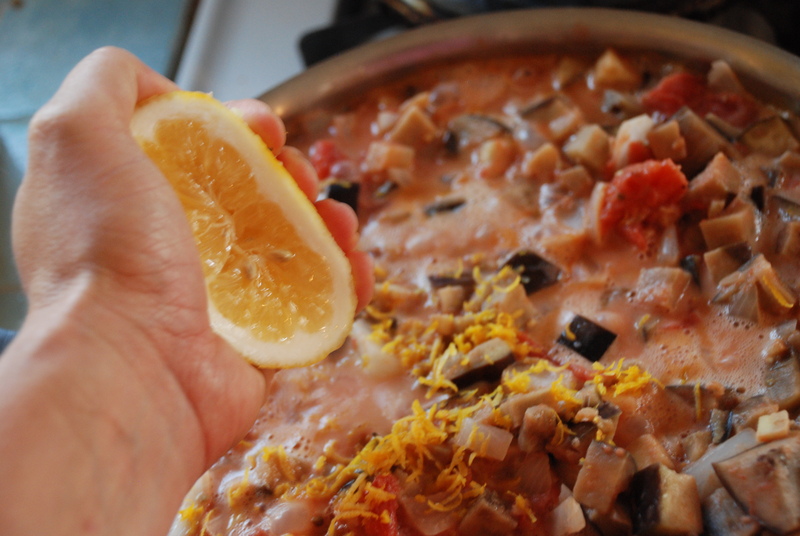 Now, ladle up the deliciousness on top of a mound of hot rice or noodles. Garnish with the green onion and sesame seeds. Bon apetit!